One thing to be clear about is that the East India cocktail is very different from the East Indian (note the final “n”). Both of them appear in the Savoy book, but only the East India is in Lommebogen. (For the curious, the East Indian is half each French vermouth and sherry, with orange bitters.) The big “controversy” with the East India is in the details of the sweetener. Apparently the original recipe is from Harry Johnson’s Bartender’s Manual, from 1882, and that has essentially the recipe below, except using pineapple syrup instead of juice, and with the addition of maraschino liqueur. A modern version, by Ted Haigh, in 2004, replaces the pineapple juice with raspberry syrup. I’ve also seen recipes with grenadine in that place. Luckily for me I’m staying limited to my three 1930s books, and they pretty much line up on this one. Cafe Royal just says cognac and 2 dashes of everything else, with a lemon twist and a cherry. I made the Lommebogen version, and didn’t do the Cafe Royal. It tastes fine, if a bit bland. The cognac shines, but I guess I was expecting a bit more flavor from the pineapple. (I should note that I used bottled pineapple juice, and I bet fresh juice would make a difference in this drink.) 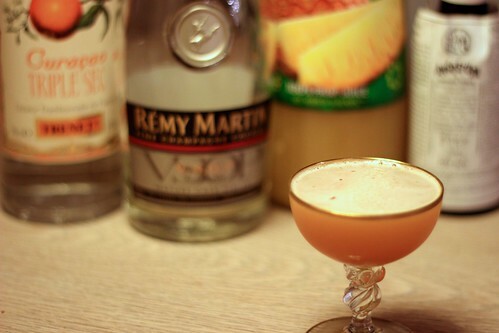 The pineapple is there, and gives a general fruity sweetness for sure, but it’s pretty subdued. Next postAre My Values Really My Values?